Water for stock and household use is a critical issue for farming across most regions. Low rainfall, high water evaporation rates, sandy soils and flat landscapes all contribute to a lack of abundant runoff and surface water resources. 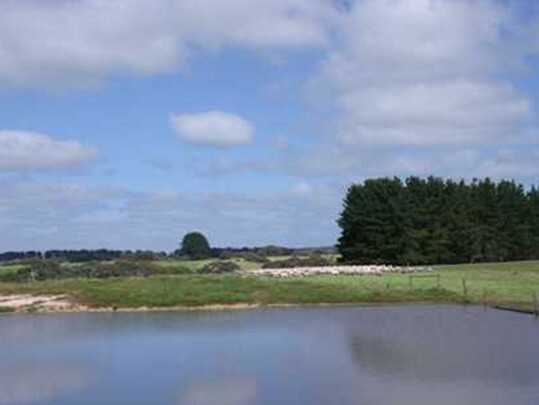 In addition, the underground water resources in many areas are too saline for stock use, surface water flows are ephemeral, and there is no connection to mains water. As a result, a substantial proportion of Island producers are reliant on farm dams to provide water for livestock and water for domestic use. Two issues then arise: first, how to more effectively capture water in farm dams and second, how to prevent loss through evaporation once the water is harvested. Graded Catchments’ or ‘Sheeted Catchments’ are strategies that can be used to increase run-off and enable more reliable capture of rainfall into the dam. This article focuses on options to reduce evaporative losses from dams. How much evaporation occurs on Kangaroo Island? The average annual evaporation from a Class A pan varies from more than 1.6m inland to below 1.3m on the coast and highlands. This can be approximately 20% of the volume of an average stock dam. Less water will evaporate if the ratio of the surface area to the volume is reduced. The surface area can be minimised by building the dam as deep and as narrow as is practical. This is highly effective but can be costly if the dam is already constructed. The presence of a saline underground water table in many parts of the Island limits the depth to which a dam can be dug. Another strategy is to construct the dam into cells so that independent areas of water can be managed to minimise surface areas. For example, divide a dam into two or more equal sized cells of water. Then, draw water from the first cell and, when possible, transfer the balance to the other cell(s) thus reducing the surface area of the remaining volume. To further reduce evaporative loss, a cover can be installed over one or two of the cells. This reduces the initial cost of covering the entire storage area and provides the greatest reduction in evaporative loss when the water is needed most and comprises less than half of the dam capacity. Windbreaks planted near dams provide some protection from evaporation. Trees should not be planted directly on top of or adjacent to dam walls as roots may increase the risk of wall failure or even draw water out of the dam. At best, evaporation rates will be reduced by 20%. Be aware that trees take a long time to reach effective size and may hinder cleaning out or enlarging dams. Floating covers are impermeable barriers that float on top of the water surface. Of the different materials (including wax, foam and polystyrene), polyethylene plastic has been found to be the most satisfactory and durable. Buoyancy cells exist within the polyethylene (similar to bubble wrap or swimming pool cover products) which is made from a tough material designed to prevent degradation from sunlight. The multi-layering of the floating cover enables some reflection of the heat from the sun. To completely eliminate the transmission of light to the water underneath the cover, the reflective top layer of the cover is white and the under layers are black. The type of polyethylene used can be recycled and is environmentally safe. Trials have demonstrated that a well managed cover can effectively reduce evaporation from open water storages by over 95 %. Completely airtight covers are expensive and do not allow rainfall to enter the dam. Modular covers are similar to continuous plastic covers, but they consist of individual units which are not restrained and they can move freely across the water surface. They can be free floating or attached to each other. Installation costs are usually less for modular covers than continuous cover types. The evaporation reduction rates are affected by how tightly the modules are packed together and may be slightly lower than reductions achieved with continuous plastic floating cover types. As each module is small in size, thousands of modules may be required to cover some water storages. Recycled waste materials can be used e.g. a module manufactured by filling the voids of the tyres with ground polystyrene foam. The recycled modular units are then closed and floated in the water storage. Minimal pollution may be caused by these units, with very small trace amounts of zinc released into the water storage. Estimates indicate that evaporation can be reduced by 70-80% using this method. Modular covers are free floating and will migrate with wind movements to the down wind margins of water storages. This is usually where the warmest water of the storage lies, and where the highest evaporation rates occur. As they are not a complete seal over the dam they allow rainfall to enter the dam. Covers must be removed from the dam before it dries out or the modules will become stuck in the mud. Floating modular covers are effective and practical, but their limited commercial availability (and cost) limits their applicability to farm dams. Aquacaps consist of a series of interlinked domes supported by a ring that penetrates the water. When the caps cover 80% of the dam, evaporation can be reduced by 70%. They also reduce water temperature and turbidity. The main limitation is cost. E-Vapcap is a floating cover like a heavy version of bubble wrap. The product reduces or stops algal growth and is close to 100% effective in stopping evaporation. This type of cover is significantly cheaper than aquacaps but wind can be a problem. Shade structures are usually suspended above the water surface with the use of cables. Shade structures reduce solar radiation and wind speed, and act as a trap for humid air between the shade structure and the water surface. All of these factors help reduce evaporation rates by up to 75% without affecting water quality or aquatic life. As the suspended shade structure is not in contact with the water, storages can be emptied with the cover in place, and any rainfall can easily enter the dam. Shade structures are not as effective in reducing evaporation rates compared to well managed plastic covers, but they are a practical option for small storages where support distances are short in length. The suspended shade cloth structures dry out quickly after rainfall preventing wind blown soil from collecting on the surface of the cloth: it either blows off or falls through. This also means that the growth of weeds or algae on the cover surface is unlikely. Shade cloth is available in a range of UV-reduction ratings. Hail shoots or valves can be installed into the cloth to reduce potential storm damage. High winds may damage the cloth and there can be difficulty in anchoring cables in poor quality soils. The main disadvantage of this product is the relatively high capital outlay on construction labour costs. The wider the shade cloth roll, the fewer cables required and this reduces the installation cost. Chemical monolayers form a one-molecule-thick oily layer on the surface of the water. As these layers are degradable, the chemical needs to be re-applied every two to four days. With smaller storages the chemical layer can be applied by hand from the bank as the chemical has some self-spreading ability. A form of mechanised delivery system may be required for larger storages. Monolayer chemicals are greatly affected by wind and wave action and their effectiveness in strong winds is very low. They are generally not as effective as physical methods in reducing evaporation. Field trials on large storages indicate reduction in evaporation of approximately 40%. Despite only a low evaporation saving rate, the main advantage of chemical monolayers is the low initial setup cost. The product need only be applied when it is required e.g. when the dam is full and/or during periods of high evaporation. Chemical monolayers are particularly suited to low risk investment options for owners of agricultural storages that do not have water in them all year. Chemical barriers are less environmentally and visually intrusive than physical structures. Although chemical monolayers are ineffective for long term treatment, without continual reapplication, they may be the only cost effective solution for dams with large surface areas. Chemical treatments are less permanent and can be applied seasonally when required, making them more affordable. They have limited impact on aesthetics but are less efficient than physical structures. The exclusion of light by physical structures will suppress algal growth and reduce water temperature. Significant reductions in evaporation can also be achieved by designing structures that are deep, relative to surface area. The best evaporation reduction in small to medium sized dams will be achieved by shade cloth or floating modular system. For large dams, chemical monolayers will be the most cost effective. Very low initial setup costs and relatively low ongoing maintenance costs. Very low initial setup costs requiring minimal capital expenditure. PAM can reduce erosion and nutrient runoff in the field and also reduce seepage from the water storage. Reduction of salt build up, improved water quality, reduction in algal growth, reduction in wave action and reduced bank erosion. Reduces algae growth, allows rainwater to enter the storage, reduces erosion from wind and wave action, slower salt build up. The product is relatively cheap and long lasting. Long lasting and prevents light from entering the storage and so eliminates algal growth and increases water quality. Heat reflective, self-protecting in high winds (up to 150 kph) whether empty or full. It is simple and easy to install, the cover is also suitable for all storage sizes, shapes and profiles up to 2 km wide. The cover can be inflated for maintenance and inspection of the storage. Reduces algal growth and wave action. The cover does not float on the water so there are no problems with changing water levels. The structure is long lasting and the cover is not affected by changing water levels. The cover allows easy access to the storage for maintenance operations. Easy to install and remove from the storage. Minimal bank erosion and turbidity due to reduced wave action. There will also be a reduced concentration of nutrients and salts in the water and possibly a reduction in alga blooms. Reduce light penetration and therefore algal growth and are virtually maintenance free. They allow rainfall to penetrate the storage and they adjust with changing water levels. Reduces algae and also reduces the amount of total suspended solids in the storage, and this product is relatively easy to install. It has been shown to greatly reduce the effects of wave action – easily installed by the customer. Easy to install by the land owner and easy to remove the cover if necessary. There is no need for an anchor trench and maintenance costs are expected to be minimal. Made from recycled materials, durable and long lasting, little maintenance, stops wave action which can be a significant cause of bank erosion.